As the press do, they focussed on only one thing - my last labour being only 15 minutes. While I believe that being fit and healthy during pregnancy can make birth easier, I certainly don't think it's a big secret... And it's definitely not the only reason! There are many benefits to being fit while pregnant, and I believe that fitness certainly helped speed the process up (more blood = more oxygen = better dilation). But I think the main factor in my super fast birth was the 4 before it. I mean, my birth canal is pretty much a slip-n-slide now. The fake tan was certainly on point... I look like I've come straight from a month in the desert, having survived on only carrots and citrus fruit. 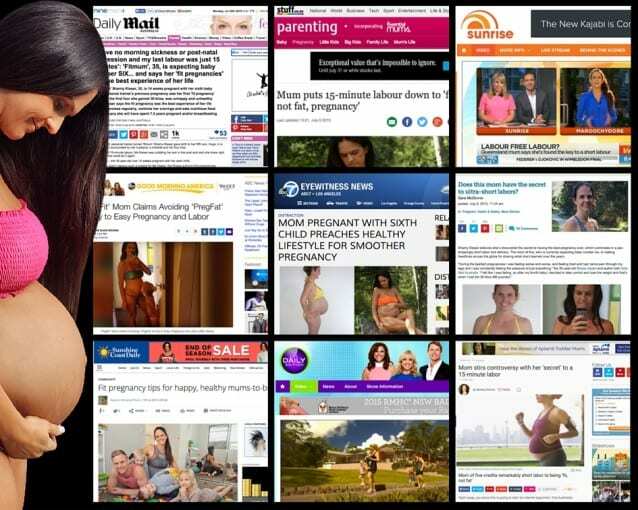 The kiwi's jumped on board almost immediately, followed by a couple of parenting websites - BabyCenter (US) and The Stir who must have read the Daily Mail article only. Once Good Morning America got it's hands on the story, it really took off and had a life of it's own. ABC in the USA simulcast it across the entire network. Here's one from LA, and here's one from ABC11. Fox28 got in on it, followed by a lineup of mummy/parenting websites: Cafemom, SheKnows, RedBook Mag, babyfile and mommypage. ​That's when the Aussies came to the party with the videos I posted above. I'd be lying if I said I didn't love the attention. For me, I dream of every mother having a pain free, fun, fit, healthy, happy pregnancy - so the more attention we can draw to this the better. Mummas-to-be need to know that pregnancy and birth are not things to fear. There is another way! If you're wanting to know about that other way, then I wrote a blog post just for you.